My decision to try and climb all the Wainwright fells was made at about the time when I had already climbed about 70 of them. Up to that point my walks were aimed at climbing the main fells along classical routes. 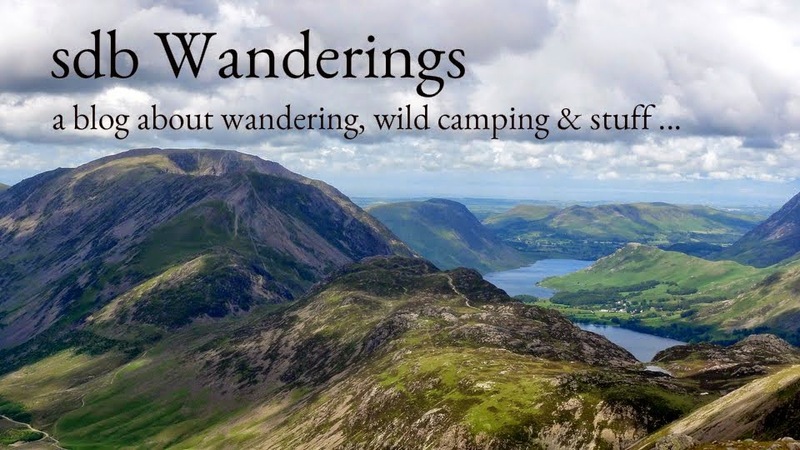 Many of these hikes had me within spitting distance of other Wainwrights but I walked on by. Three of the fells climbed on this hike were a case in point. I had climbed all their neighbours, some of them many times but never made the extra effort to wander over to them. So this was really a 'mopping up' exercise as well an excuse to revisit a favourite area. And so, having parked up at Seathwaite, I started the steep ascent up to Base Brown at 5pm, conscious that I had about 3 hours of daylight to reach Kirk Fell where I hoped to camp. There were hazy views from Base Brown summit across one valley to Brandreth and the opposite one over to Glaramara. The onwards way led up to Green Gable which was moving in and out of cloud and unfortunately was mainly in cloud when I got there. The path up to Green Gable is obvious and easy going. It was therefore surprising to count 18 cairns along a stretch of perhaps 200 yards leading up the summit. Totally unnecessary in my opinion. From Green Gable summit all the high fells including neighbouring Great Gable were shrouded in mist. Windy Gap was just visible and that was where I headed before dropping down the unstable scree path towards the 'tongue' of upper Ennerdale. Thankfully I wasn't on this path for long before deviating off towards Kirk Fell. It was starting to get dark by the time I reached Kirkfell Tarn so after filtering some water I headed off to the Wasdale side of the fell where there was a flat grassy area and set about making camp. It didn't take long. Just a simple matter of rolling out a ground sheet, inflating the mat and then unpacking the sleeping bag and bivvy bag. Five minutes later, water was on the boil ready to reconstitute a much awaited chilli con carne. I had a tarp with me but didn't use it as it was a calm night with no rain forecast. I fell asleep gazing up at the night sky which by now had cleared to reveal a beautiful star studded scene within which the milky was was clearly visible and odd shooting star streaked across the blackness. I woke with the brightening sky at about 6am to find my bivvy bag soaking with morning dew, both inside and out. The sleeping bag was wet on the outside to quite an astonishing degree. In retrospect I should perhaps have pitched the tarp as a lean-to, not to provide any weather protection but to act a 'dew sponge' by having moisture condense on it rather than me. Lesson learned, I made breakfast before enjoying a magnificent sunrise between the 2 'Gables'. By 7am I was packed up and heading off up to Kirk Fell summit, a few hundred yards away. There was a lovely view from Kirk Fell summit. Its a great spot from where to survey some of the giants of Lakeland. The next target was Seathwaite Fell around the other side of Great Gable. There is a traverse path which circumvents the apron of Great Gable. It has a reputation for being difficult to follow and a bit precarious but taking it would mean avoiding significant height loss if I had to drop down to the main path. Great Gable : there is a traverse path on there somewhere! The traverse route was just visible skirting across the flanks of Great Gable as I descended Kirk Fell. Once down, I wandered up the scree slope to pick the path up. It is an exhilarating route, a little like the climbers traverse on Bow Fell but longer and more convoluted. At some points it seems to fade away, only to reappear 20 yards later. Thankfully there are a few well placed cairns along the way to help with navigation. There is path there ... honestly ! Eventually the traverse joins the main path by the stretcher box at Sty Head. From here I took the main path up to Sprinkling Tarn before heading along to Seathwaite Fell. For a change, there were no tents around Sprinkling Tarn but there was plenty of evidence of previous camping activity, with discarded gas carts and litter pushed between rocks. Its a shame that a few mindless morons have to spoil the reputation of the majority of responsible wild campers. Sprinkling Tarn does unfortunately tend to attract these types though. I therefore filled up my litter bag and headed on, now with the extra burden of 'chav campers' garbage. Seathwaite Fell is a little gem of a hill, nestled between much higher neighbours but offering a great vantage point for admiring them. 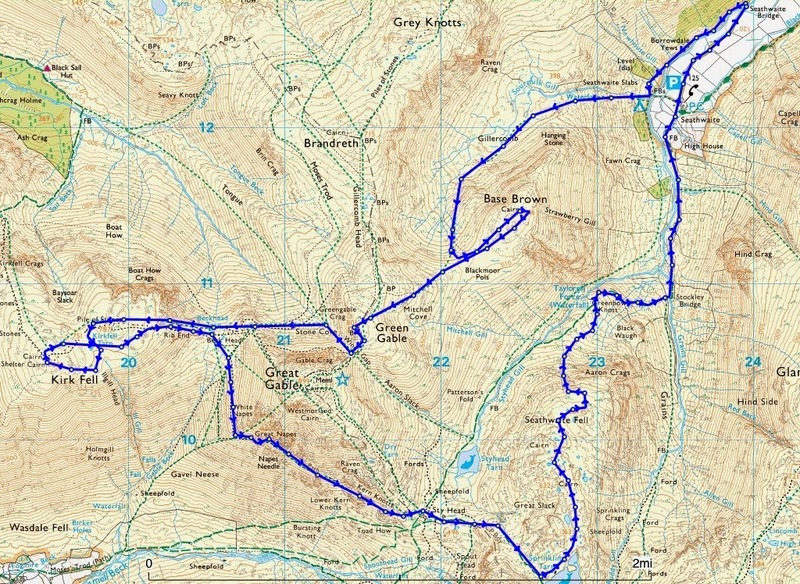 On the map there is no obvious path off Seathwaite Fell to the north, so I decided to follow a water course which was fairly steep and a bit precarious in places but I managed to pick my way down until eventually joining the main Sty Head path down to Stockley Bridge. Half an hour later I was back at the car and happy to have satisfied my 'fell fix' for the next few weeks. It was a steep descent ! Fluid : 600ml Sigg bottle (100g empty), 1 litre Nalgene collapsible bottle (45g) + Sawyer Squeeze filter (84g) Food : Fuizion chilli con carne, Buttered Bread, Supernoodles,various sugary snacks. Bits & Bobs : headtorch and spare batteries, Iphone + Anker 5800mHh battery, victorinox knife, map & compass, basic first aid kit and Petzl e-lite, spork, various fold dry bags, flint & steel, plastic trowel. Camera : Panasonic DMC-LX7 & lowepro case. Clothes : Ron Hill wicking T-Shirt, Rab 100 wt fleece (250g), Montane lightspeed jacket (160g), TNF Meridian Cargo Shorts (190g), ME beany, Rab phantom grip gloves, sunglasses, Buff, Innov8 short socks. Hard Shell = Mountain Equipment Firefox jacket (320g) not used. The only thing I used for the first time was the MLD bivvy. This really is appropriately named as it is indeed 'superlight'. It is easily big enough to swallow the mat and sleeping bag with plenty of room left. The only issue I had was with a significant amount of condensation/dew on the outside and inside of the bivvy and as such my sleeping bag was damp. It was one of those nights though. No wind, about 10 degrees and a clear sky. Having camped in these conditions before, any shelter (tent flysheet or tarp) would have been soaking wet. As I didn't use a shelter, my bivvy was essentially the outer layer and therefore got wet. Talking to others on twitter about this I reckon that if I had pitched the tarp, it would have 'collected' most of this moisture and left me much drier. The alternative might have been to use a more 'industrial bivvy' like my Rab Ascent, which is an Event bag designed for stand-alone use but it does weight 600g. Any other thoughts about this would be appreciated though.